If you are a Catholic and you also have the added grace which God gives to those who keep His donkeys, there is no better start to Palm Sunday than looking at your donkeys and wondering which of them Jesus would have chosen to ride into Jerusalem. Rubí is a very contemplative spiritual donkey but undoubtedly too awkward to be ridden, and she would have stopped to eat all the palms put down on the road, thereby ruining the whole occasion by delaying Jesus’ arrival in Jerusalem. Morris is a very strong donkey and could have easily borne the Saviour on his bull-like back, but he would have spent the entire journey trying to draw the attention of the crowd to himself, becoming the whole focus of attention, thereby undermining the saving mission of the Messiah. Aitana would simply have turned around and gone in the opposite direction, probably in the direction of Jordan, which would have ruined the entire episode and spoiled God’s plan for salvation. So clearly, Matilde must be the right donkey for the job. Not only does Matilde look the part (she has a carefully calculated persecution expression) but she is also proudly middle-eastern demeanour. As a part breed Andalusian donkey she can trace her roots to Moorish Spain, and beyond… to the donks of Jerusalem. In fact, the more I look at Matilde, the more I wonder if she WAS the actual Palm Sunday donkey. And that is the start of a story. This Easter I shall be in England for a few days and the story of the Palm Sunday donkey – which will be based on Matilde – may become a children’s story. I am starting discussions with a well-known illustrator of children’s books. We shall see how things develop. 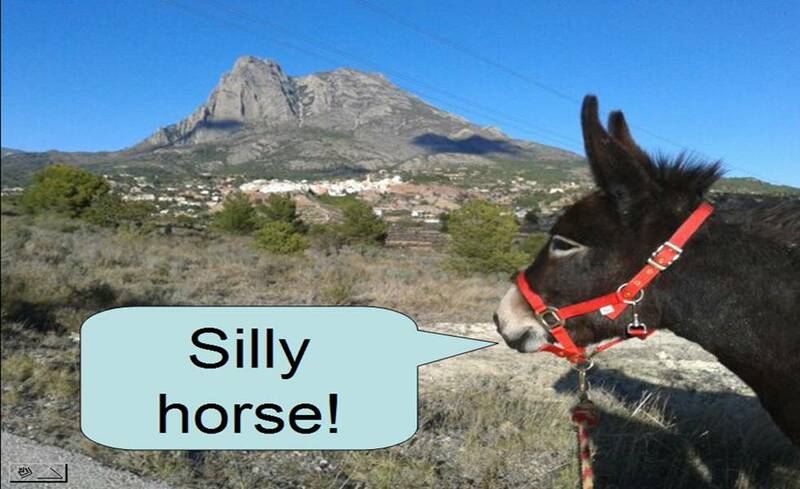 Here in El Caserio, Barbara is coming down from France and takes over for a week looking after the donkeys. She is going to explore the Camino de Levante (maybe all the way to Compostela) after I return home from my Easter break. After the horrendous business with the hunters of Finestrat, I thought my trials were over. No chance. Now I have another minor annoyance on my doorstep: Jehovah’s Witnesses. I do not joke. The people next door to me are English. Some of you will remember the incident last year when they first arrived, when my donkeys’ field was flooded through the sluice being left open and unattended for hours. To this day, I have no idea why that happened: he had no business to tamper with it and said he just “wanted to see how it worked” ! This cost me a huge bill in veterinary fees and medication for the donkeys to prevent infection from bad water. Honestly! Have these Jehovah Witness people no sense but to crap on their own doorstep? I have already been worn down these past weeks by the aggression of the hunters, and now I have the entirely unwelcome revelation that I have members of a satanic sect living next door. From what I know of the JW’s, they tend to leave you alone after you hit them with a little Catholic Truth. My Don Quixote was invited to the Episcopal church down the road from us. Unfortunately it was very cold this morning so the church decided to skip the procession of Sunday schoolers around the graveyard which he would have led. Gareth, consider that the Jehovah’s Witlesses were put there for your salvation! Next time you can just call them Arians and be done with it. Arrrrrghians does have a nice growly ring to it when enunciated properly, no? I live in the country myself, and they drive up to my door. I thought they only knew how to walk house to house but evidently some foolish person taught them to drive. Ah well…. Our Trooper is learning how to ground drive very nicely. I think he would do well in a Palm Sunday parade, but palm branches might be a problem. Have a good trip and a happy Easter. Us Orthodox have to wait until May, of all things! Your blogs are much enjoyed by my at least 80% Catholic Facebook friends! Thank you Catherine and Jim for your comments. Well now there’s some slightly better news: it appears I have only ONE Jehovah Witless living next door. The unfortunate husband stopped by the donkey field while driving to collect his Sunday paper and went to great lengths to tell me he is not a Jehovah’s Witless (“And she wasn’t when I married her…”) and he was obviously embarrassed by the whole business. He shared with me that she had bought the apples a week earlier, ready to bring round as the pretext for introducing her heretical Witless literature, so this act of foolishness was long in the planning! She must be the most unsuccessful Witless of Jehovah in the short history of their heretical sect, as she hasn’t yet managed to convert her own husband, let alone trying her silly games on her next door neighbour. A friend of mine locally who knows the group of Witlesses she belongs to (and was approached by her in Finestrat on another failed attempt to spread the Witlessness) says she was probably put up to it by the group. They are known for challenging members of their sect to target particular people they have identified. Maybe she was coerced into doing it? Who knows what these nutters get up to at their Sunday meetings! Anyway, hey ho, it’s all part of the “quiet life in the country” I came here for…! I must get the priest to come here and say the prayer of Exorcism.